Skiing injuries are some of the most common issues that physiotherapists treat. Skiing, snowboarding, and similar activities present a variety of risks of which you need to be aware. By taking simple steps to reduce your risk of injury, you improve your overall conditioning and avoid the injuries that keep you off the slopes for extended periods of time. 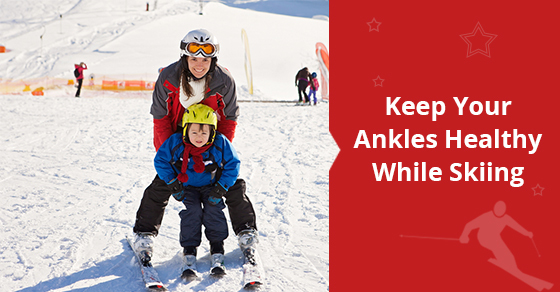 The following will help you avoid ankle injuries while skiing and understand the different types of injuries that may occur. Know your injury types The most common injuries are those that result from falling. This leads to knee, shoulder, hand, and back injuries. Beginners should take lessons in order to become familiar with the basic techniques related to skiing. You should learn how to identify any conditions that could lead to falls. These include icy surfaces and underlying rocks. Also, if your body is fatigued, you’re less able to respond quickly to any changes in the environment. Physical fatigue leads to mental fatigue, and poor concentration or focus can cause you to slip on an icy sidewalk. Other injuries include those that result from collisions, as a skier can collide with others or any stable object. Give other skiers who are ahead of you the right of way. When passing skiers, communicate your direction so that they have the ability to move out of the way and prevent injuries. Choose the right exercise program Strength training helps to build muscle mass, increase joint stability, and improve function. Your program should consist of exercises that target large muscle groups while integrating the core stabilizer muscles. Squats, lunges, and push-ups are basic exercises that can support your skiing. A qualified physiotherapist can provide you with a stretching and exercise program that addresses weaknesses or limitations to prevent future injury. Change your exercise program regularly. Use strength training, flexibility, plyometrics, and other modalities to improve your function. Managing your weight Managing your bodyweight can also help you avoid ankle injuries while skiing. A healthy diet and lifestyle are the key elements of any goals related to functional health and improved performance. Skiing can lead to an increase in the loading of the joints, and repetitive impacts can stress the muscles and connective tissues if the legs aren’t conditioned properly. By reducing your bodyweight, you decrease the impact forces placed on the body and minimize the risk of injury while skiing. This allows you to get the maximum enjoyment out of this popular pastime so that you can continue to improve your physical fitness.